Streema is a free online radio directory to discover, share, and listen to radio stations from all over the world. There are more than 70,000 radio stations like BBC Radio 1, Absolute Radio, and more anyone can tune into online. Get started by heading to the Request a Radio form. When submitting your details please be as accurate as possible, this means to use the correct spelling, avoid using ALL CAPS, and when you’re finished proof-read so there are no mistakes or any offensive language that will get your station rejected. The official name of your radio station – If it’s all upper case and includes “AM” or “FM” in the name then include it, for instance NQR.FM. The full URL of your homepage, for instance "http://www.nqr.fm/". Choose the main language spoken by your station, for instance "English". Enter where your radio station is located, for instance "Manchester, United Kingdom". Choose up to 4 genres your station focuses on, for instance "Top 40", "Rock", etc. 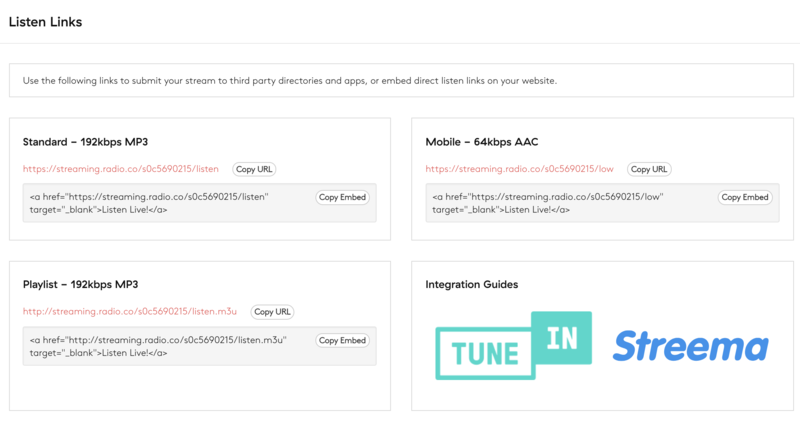 Add your radio station's stream URL, this can be found in your Radio.co Dashboard in the Listen area under Streaming Links. The station owner's name or if you're submitting the station on behalf of the owner then enter your name. The station owner's email or if you're submitting the station on behalf of the owner then enter your email. If you are affiliated with the radio, as a DJ, program manager, or anyone involved in keep the station going, then tick "Is Affiliated". Your radio station's slogan, for instance, "Manchester's Northern Quarter Online, Mobile, & DAB Station". A brief description of what your station broadcasts and any further details to promote your shows, for instance, "The freshest sounds from Manchester's Northern Quarter! If you're a DJ, Radio Presenter, Promoter, Digital/Creative that wants to get involved with NQR.FM then get into touch: info@nqr.fm." Adjust your station's logo so it's 128x128 pixels and make sure it's either in PNG, JPG, or GIF format. The Twitter URL of your station, e.g. "https://twitter.com/nqrfm". The Facebook URL of your station, e.g. "https://www.facebook.com/nqrfm". Additional info to accompany your station like where listeners can get in touch with you or other places you can be found. When you've entered your details submit it to Streema - You should get the following message "Thank you for requesting [STATION NAME], we'll be in touch soon." Your station will get listed on Streema within 3-5 working days, but if there's an issue in your listing then Streema will be in touch.